Just in time for the holidays! We have gone through many flashlights through the decades. The good news is they keep getting better. Our favorite brand is Fenix Lights. The flashlights are built for a lifetime of use. We own 6 different models from them. (Someone really likes flashlights). Here are a top 3 models along with the honorable mentions. Why we love it: Rugged, lightweight and bright! with an adjustable focus beam. Pure awesome in the palm of your hand. We own 2. The FD41 has a simple on/off switch with a separate button to adjust power. No clicking through light settings over and over again! On the high power setting you can light up an object 1000 ft away. Long battery life too. We have used this as a "lightbar" on our truck during tricking sections on the trail at night. Yes it's can be that bright! What would we change? : The only improvement would be to have a built in USB charging port. For this model the battery has to be removed to charge. We carry a spare battery and have home and auto chargers for the 18650 battery type. 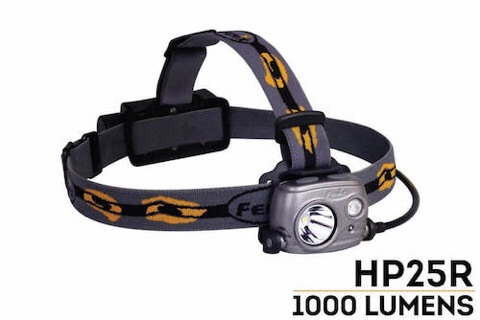 Our second headlamp model from Fenix lights. We also own 2 HL35 headlamps. While the HL35 is a great headlamp the HP25R offers greater versatility with its spot and flood beams. You really can't go wrong with either model. The HP25R is more powerful but a bit bulkier than the HL35. Why we love it: It's bright! (Are you catching on to this theme?) but also has nice low LED beams for around your campsite or vehicle. USB charging port for easy charging. What would we change? We wish the red led light was brighter. We call this flashlight the Dog Walker and Trash Taker Outer. 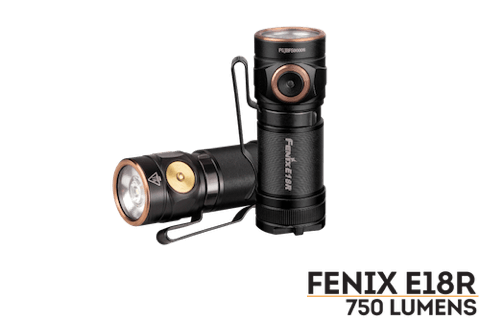 This is just a great versatile and compact light to have around the house or in your vehicle. With a magnetic base it can be attached to your hood if you need to do some work or inspecting of your engine compartment. Why we love it: Super compact, super bright, and very easy to charge with its convenient magnetic charging cable. It fits in your pocket without any bulk if you need a powerful light for walks in the dark. The CL25R compact lantern - Bright when you need it and dim when you don't with a great red LED option. We use that for cooking to keep the bugs away. It also has a magnetic base. The TK72R flashlight. 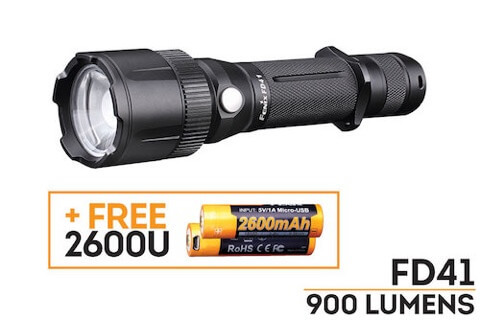 9000 lumens of pure power - Night to light up the desert? Want a light the space shuttle can probably see? Then this floodlight is for you! The LD15R Right Angle Light - Another cool compact flashlight with a magnetic base. The right angle makes it great for an overhead light while cooking. It also includes a red LED.